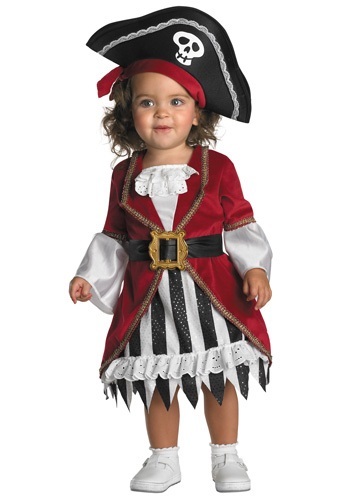 She may only have just taken her first steps, but is she ready to command a pirate crew? We say, yawr she is! When she turned two you started whispering pirate slang in her ear. You taught her the "Yo ho," song. Your spouse wasn’t too impressed with that one, but you still saw smiles beaming your daughter as she easily commanded the one-syllable lyrics. You read her Robert Louis Stevenson's Treasure Island as a bedtime story. You used the lightsabers her uncle had given to her to teach her how to sword fight and we won't even lecture you about canonical integrity. Because that's pretty cool of you. Now all you're tasked with is setting her into this Toddler Girls Pirate Costume, effectively completing her training as your first mate. She can be the tiniest member of your family's buccaneer-themed crew, or she can give that ol' scallywag Blackbeard a run for his money as the most notorious pirate of all time. She is the only one, since the day she was born, that you would trust as your first mate. She never tells you that the couch is just a couch. No, she just jumps on the makeshift pirate ship, and yells "Land ho," jumping down to fight for treasure. All the while she is swinging her lightsaber around the seven seas, she is laughing and smiling. And you would play pirates every day, because your first mate's happiness is worth more than all the pirate gold in the world.